Losing weight at any age requires a combination of regular training and dietary adjustments. To start shedding the extra pounds, implement a training schedule that combines different styles of exercise, and focus on eating natural foods and drinking plenty of water. If you're over 40 and determined to lose weight, you've got to be single-minded; take your eating and training seriously, and don't make excuses when you feel like dodging the plan. Implementing regular strength training into your routine is the best way to start losing weight. This is a high-intensity activity that uses up significant amounts of stored energy. For beginners, two to three sessions per week will be enough to produce noticeable fat loss results. Each session should be 45 to 60 minutes, with a combination of compound, or multi-joint, movements such as squats, lunges, deadlifts, bench presses, overhead presses, and bent over rows. Some isolation movements, or single joint, can also be included: bicep curls, triceps dips, calf raises, cable flys and hyperextensions. Always warm up and have a trainer demonstrate the exercises to you if you are unsure about them. Cardio is king for losing weight. There are many variations of cardiovascular exercise that will produce results: running, swimming, cycling, hiking, team sports, jumping rope, rock climbing and rowing. If you choose to do cardio without any added resistance training, aim for three to five sessions per week, at 45 to 60 minutes per session. If you're integrating resistance work, two to three sessions is enough. And if you haven't exercised in a long time, be sure to ease into cardio -- choose an intensity that is appropriate to your current fitness. Always warm up first and make sure you stay hydrated. Interval training is sort of like an intersection between resistance and cardio training. This is a very high-intensity style of exercise, and should be approached sensibly. To perform an interval session, choose an exercise, such as sprinting or jumping rope, and work as hard as you can for 20 to 30 seconds. Take a 20- to 30-second break, and repeat this sequence 10 to 15 times. 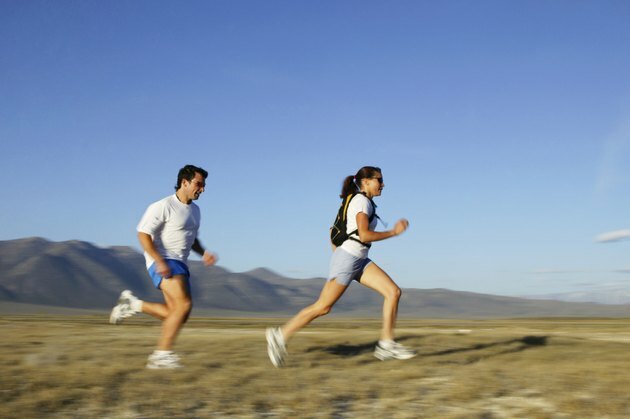 Interval training draws on stored fat for fuel and is extremely demanding. Two to three interval sessions per week is enough, particularly if you are also doing other types of exercise. One of the best ways to lose fat in your forties is controlling what you eat, and how much of it. If you focus on eating natural foods in sensible quantities, you will lose weight. Eat lean meats, fish, poultry, eggs, nuts, seeds, whole fruit, vegetables, and small amounts of dairy and whole grains. Avoid sugary drinks -- including fruit juice and sweetened tea and coffee -- as well as alcohol as much as possible. Drink plenty of water and supplement with protein powder, fish oil and a multivitamin to make sure all your nutritional needs are being met. What Is a Shredding Exercise?